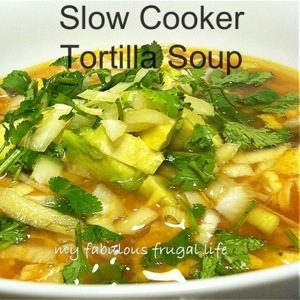 This is one of my absolute favorite and easiest slow cooker recipes. You can not go wrong making tortilla soup! It is also very healthy and can be made vegetarian. Chop onion and bell pepper. Add to slow cooker. 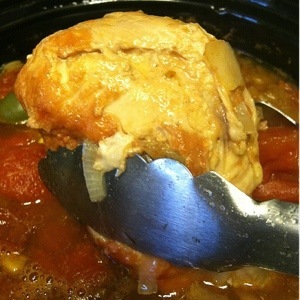 Add jalapeño, garlic, and chicken to slow cooker. 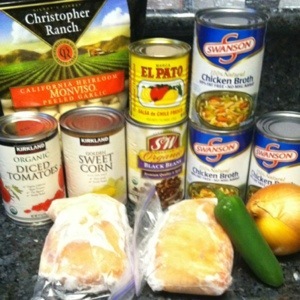 Add cans of tomatoes, El Pato sauce, and broth to slow cooker. 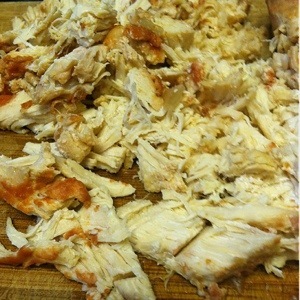 Shred chicken with a knife and stir back into soup. I cannot tell you how easy and delicious this soup is! I made this for the first time last year, when I realized I didn’t have enough chicken for my slow cooker chicken tacos recipe. I buy most of my canned items at Costco with the exception of the El Pato sauce. I like to make this on Mondays for the upcoming week. I literally throw everything into the slow cooker and dinner is done when I get home from work. My husband and I then have our lunches for the next few days made as well. Chicken tortilla soup is my second favorite food! Do you mind if I make a gluten-free adapted version of this for my website and link it back to your blog? I think my readers would love it and I need some more crock pot recipes!